Canonical has picked up its first pair of manufacturing partners, keeping to its schedule to roll out the first Ubuntu phones this year. The Linux-based OS company announced it's partnering with Meizu and BQ Readers to release its first Ubuntu Touch OS handsets. Although neither of these manufacturers carries a US large presence, Canonical Founder and CEO Mark Shuttleworth explained during a Town Hall Google Hangout that these will be key partnerships to reach underserved markets. Specficially, the Spain-based BQ Readers will help Ubuntu broach the European market, and Meizu's reputation in China will open up a pool of Linux phone users in Asia. "The mobile industry has long been looking for a viable alternative to those that reign today," Shuttleworth boasted in a release. "Ubuntu puts the control back into the hands of our partners and presents an exciting platform for consumers, delivering an experience which departs from the tired app icon grid of Android and iOS and provides a fluid, content-rich experience for all." Details about the actual smartphones and supporting carriers still remain a mystery, but Shuttleworth teased that two more manufacturers with "household names" should be coming on board in 2015. The company said its next challenge will be to bring app developers aboard their ecosystem. Shuttleworth aims to have the "top 50 mobile apps" on Ubuntu Touch by the end of the year. Although the company has attracted major name stays including Evernote, LastPass and Grooveshark, there's still a lot of work to do. 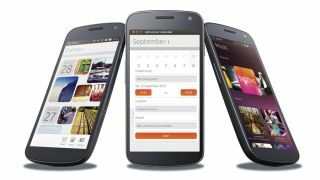 Ubuntu put forth some big, ambitious goals but there's only a slim chance we will see a major Ubuntu phone released on one of the major carriers in the States any time soon. Still, Canonical's strategy is right on track as its Community Manager Jono Bacon previously stated in a Reddit AMA. Earlier this year the open-source OS company laid out its plans to team up with smaller OEMs, which it's doing right now. Bacon also noted that we may not see Ubuntu phones from major manufacturers or carriers until next year. Canonical has had a long journey to get to Ubuntu phones, find out how it all started.